Accessibility for New England is a proud authorized supplier & installer of the commerical division of EZ Access Ramps; Titan Aluminum Ramps. There are almost endless configurations therefore, please choose your needed structure below and call our experts to help guide you choose the best model for your commercial building. See a Commercial Ramp Installation in Massachusetts that meets all standards set by the Mass Architectural Access Board HERE. with 5' x 5' Landing shown above. 30' Turn Back Ramp System with 5' x 5' Landing & 30" ADA/IBC Step System shown above. 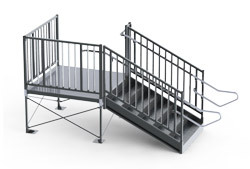 36' Corner Turn Ramp System with 5' x 10' Landing & 36" ADA/IBC Step System shown here. Other models & sizes available. 36" ADA/IBC Step System with 5' x 5' Landing shown here. Other models available. Please call for more details.